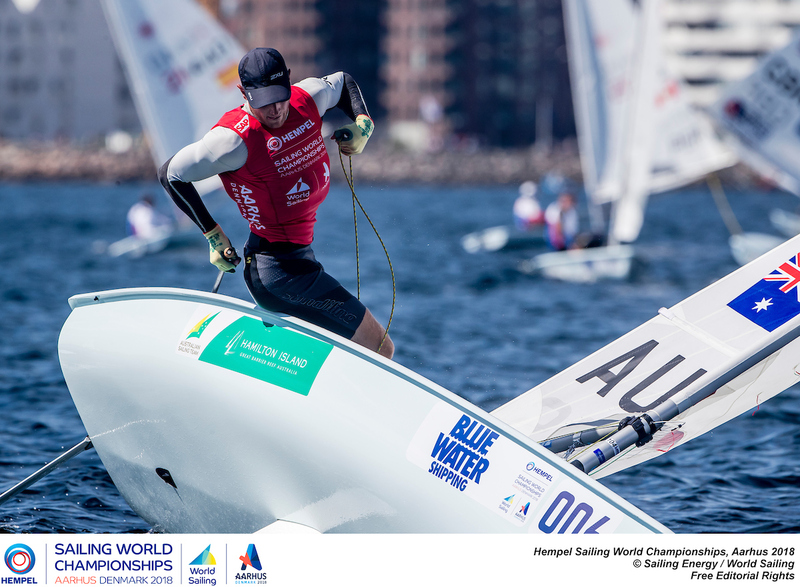 (Aarhus, Denmark) The World Championships in Denmark are coming to the business end of the week and the fleets are beginning to narrow toward the medal race. The Laser Radial Gold fleet only completed one race, while all other fleets each finished the intended two. The medal race fleets could be decided tomorrow – wind permitting. The forecast stable 8–10 easterlies did not materialize and all the fleets competing today had to pick and roll their way through soft patches. Some fleets were on the water for six hours – starting, stopping, and pressing in shifting pressure on the Bay of Aarhus. 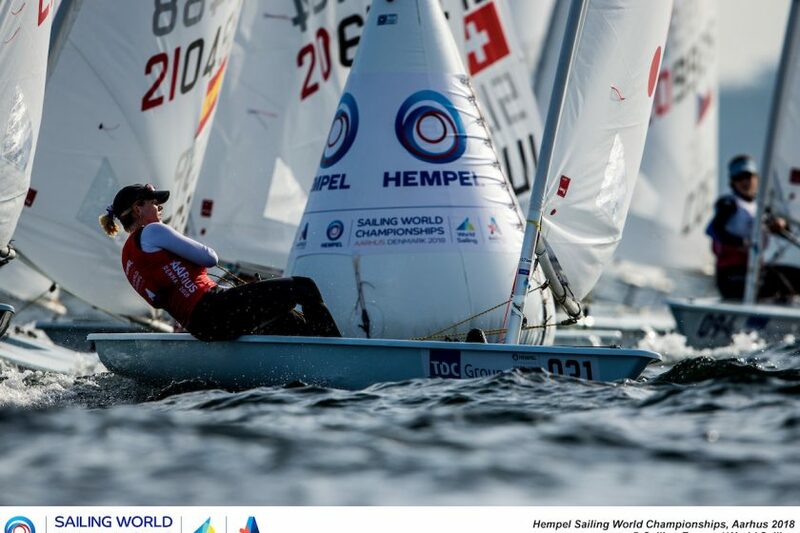 The light wind brought new conditions to the World Championships and consequently, new names to the leaderboards. In the Laser Radials, the Gold fleet only managed one race and the second was abandoned. 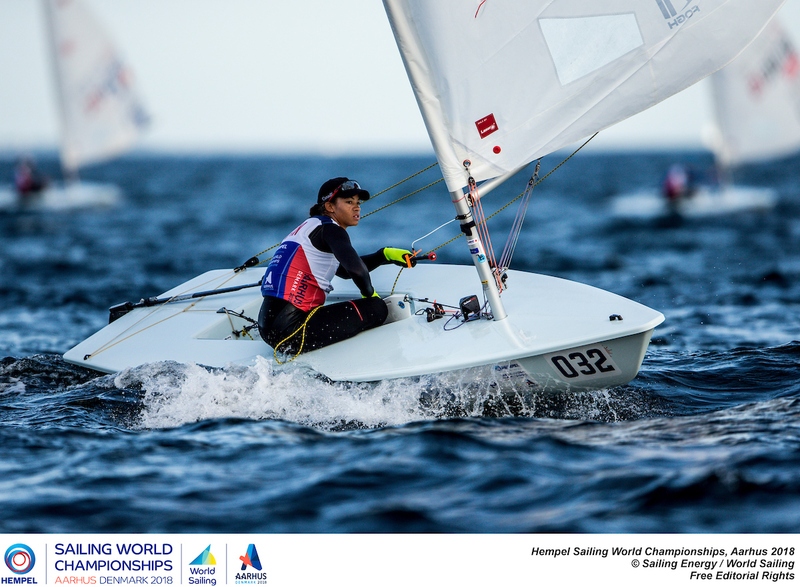 Although Danish Anne-Marie Rindom continues her lead, Paige Railey of USA sailed one of her best races today in the finals, only to climb back into second place just one point behind Rindom. Line Flem Høst of Norway was not able to maintain her top position and fell to seventh place after finishing 29th in race 7. The surprise today came from Canadian Sarah Douglas, who has been steadily working her way up the standings at this World Championships. She sailed an outstanding race today to finish third, which has bumped her up to third place overall headed into the final day before medal race fleets are determined. The Laser Standard races continue to show how strong the competition is in the Gold fleet. Today Australia’s Matthew Wearn proved himself as the greatest rival of his compatriot, Tom Burton, the 28-year-old Rio Olympic champion. 22-year-old Wearn, who claimed the European title this year, is now leading after two single-digit races on a day when most of the top 10 registered at least one huge double-digit. For Pavlos Kontides of Cyprus, who finished 12th and 4th today, his results pushed him up to second place overall behind Wearn. However, New Zealand’s overnight leader Sam Meech was not so lucky, finishing 34th and 7th today and now sitting in third place overall. “Today was an absolute nightmare,” Meech shares. “I think I sailed probably the worst race of my year so far, unfortunately, in that first race. It was just bad timing to have it, especially after all the work I have put in this year. Racing continues tomorrow, which will conclude the final series and the medal race fleets will be determined. The Lasers will then have a lay day and medal races will be held on Friday, August 10.